Black Star Canyon is part of Southern California's permanently protected wildland located in eastern Orange County. Our figure eight course will fill all your senses in this stunning region. Black Star is known for its soaring sandstone cliffs, Red-tailed Hawks flying overhead, and majestic panoramas of the Santa Ana Mountains. Pre-running the course is not allowed unless it occurs on wilderness access days or docent-led activities. Pre-running the course may jeopardize our ability to offer these events. s there a park entry fee? There are no park entry fees for these events. Tell them you are here for the Into to the Wild Trail Run. The August summer runs will be held at group site #3. The March run will be held at group site #3. We always encourage carpooling. Yes, but we order shirts in advance so we cannot guarantee that you will receive one or if we have extras you may not get the correct size. Also, when you register race day it is more expensive. Please register on Active.com or download a registration form and mail it in. Glad you asked! Contact the race directors at [email protected] for details on volunteer opportunities. If your children need service hours for school they can get them here! We give our volunteers a free entry into one of our races. Not technically. You should have ample time to finish even if you need to walk. We will do our best to keep track of the last runner and supply them with an aid station prior to breaking it down. Why aren’t maps posted for Black Star and Limestone Canyon races? Do to our contract with the Irvine Ranch Conservancy we are not allowed to post a trail map. These are protected lands that are only open to the public for docent led activities or on open access day. 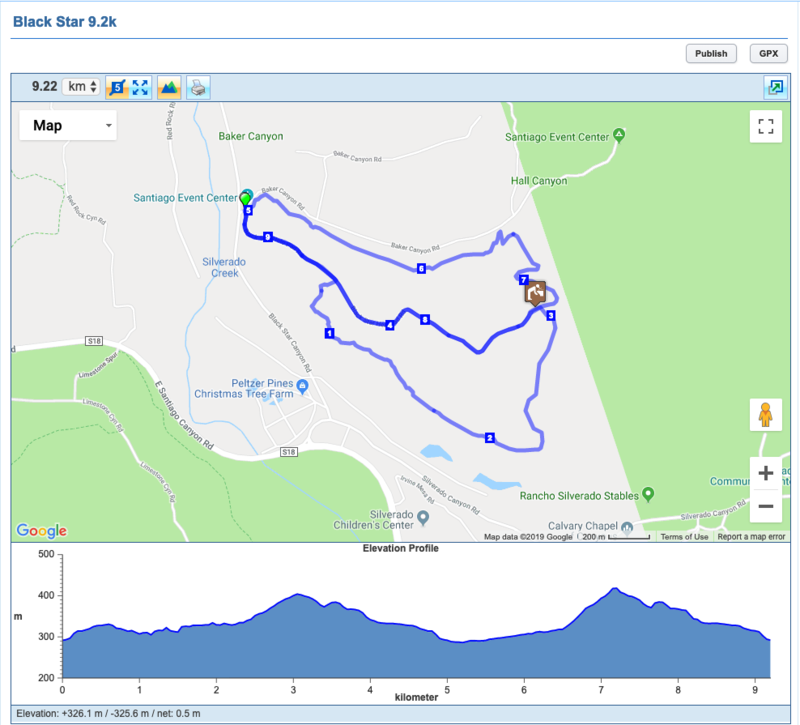 We sometimes come out to the open access days in these areas and offer our course maps and take a group on a trail run so they can test the course. Which course is good for my first trail race? The summer 5k’s and the 10k in Irvine Park is the course for beginners. The 9.2k in Black Star Canyon and the 12k in Limestone are moderate. The 21k’s are difficult and not recommended for 1st time trail runners. Is this a good course for my first 21k? The 21k course is challenging. It features steep climbs and descents. Unpredictable winter weather damage can result in mud, water crossings, slippery areas, and uneven heavily rutted trails. Are the courses exactly measured? Trail running is not an exact science. We do our best to provide a close measurement for distance. Weather may force us to change the course at the last minute. How do I follow the course and will there be mile markers? For first time trail runners you will need to be constantly aware of ribbons in bushes along the trail that mark the course. If you haven't seen a ribbon in a while turn around, you have gone the wrong way! There will also be arrows directing you which way to turn and run on the trail. If there is an X marked on the trail do not cross it. That is the wrong way too! What fuel/fluids will be provided at the aid stations? The typical aid station for the shorter distance will include water and an electrolyte. The longer distance aid stations will have water, electrolyte, orange slices, salty items, sweet items, and energy gel. The electrolyte and energy gel will be based on our sponsors. All runners receive a shirt, medal, and an entry into our raffle! Overall cash awards to top 3 male and female winners. Other awards vary from our partners. Age Group Awards for 1st in their age group. Is there a park entry fee? How was Into the Wild Black Star Canyon 9k?